For one as young as Anandhi, she has already proved her mettle as a fine actress right from her very first film in Telugu. While she has gone on to act in several films after that, including those in Tamil, discerning moviegoers always try to co-relate with her acting in her debut film.“Bus Stop” was shot in 2012, when she was 19, and it did not come to her in any conscious way since Anandhi's entry into movies was not pre-planned. It came to her because of a sudden opportunity, when she was participating in a dance competition. She caught the attention of the Telugu film director who could immediately spot her potential and decided to cast her in “Bus Stop”, which proved to be a huge success. It had a mature theme and her handling of it won her acclaim for her performance of Seema, a loose natured fun loving girl. The remarkable aspect of it was that she was cast alongside veterans like Prince and Kanna as well as another newcomer like her, Sri Divya, but she seemed to have hogged the limelight in this debut film of hers. Although she immediately received a handful of offers for upcoming Telugu films, the next lot of films did not fare well in the box office, making her consider her options in the Tamil film industry, signing up for “Poriyaalan”.Her performance in this her very first Tamil film, was well received, with the film itself being a moderate commercial success. Her next venture in Tamil was for Prabhu Solomon's directorial venture “ Kayal”, in which she plays the role of Kayal. Something else happened in her career with this film. Instead of her original name Rakshita which she had been using so far, Prabhu decided to give her the name Anandhi for this film, and that is the name which has made her more famous across the Tamil and Telugu film industry. In her brief film career, she has so far appeared in about 11 films a majority of which have been in Tamil, and she will soon appear in “ChandiVeeran” with Atharvaa, and “ Trisha Illana Nayantara” with G.V. Prakash Kumar. 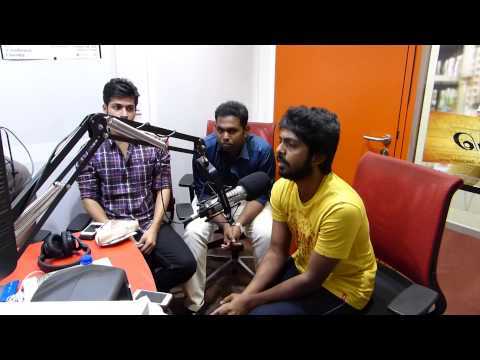 Suryan FM 93.5 'Poriyaalan' Team on Blade No1 !! !